Intense competition is developing between the mega hubs of Turkey, the Arabian Gulf, and Eastern Europe. The region is at an undeniable crossroad and the airports in the region are competing to become the region’s dominant transfer hub. In Turkey, Istanbul New Airport is currently under construction and is set to be the largest in the World in terms of passenger capacity. Once fully complete by the end of 2017, the giant 150 million passenger capacity air terminal will highlight Istanbul’s growing reputation as a global travel hub. The Middle East is undertaking major investments, as the operations of its main airlines continue to expand rapidly. Saudi Arabia and Oman are embarked on major expansions. Dubai World Central is a continuing project that is establishing the World’s largest airport by 2027. Other projects in the region include Hamad International Airport, Jeddah King Abdulaziz International, and King Khaled. In Eastern Europe many other expansion projects are also in the pipeline. 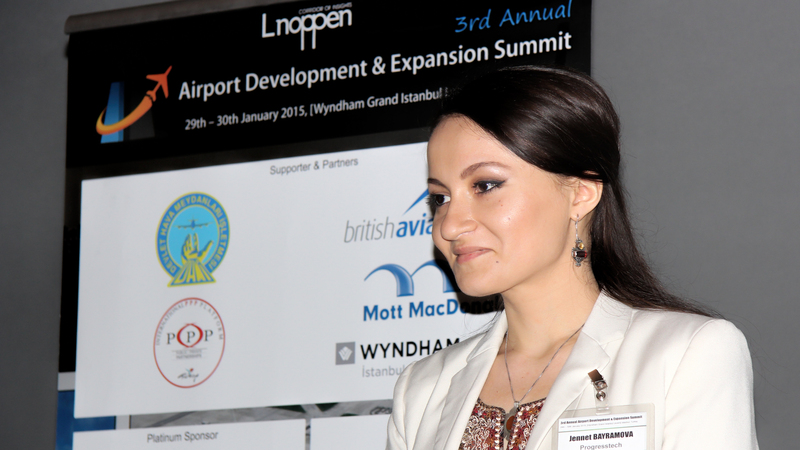 Lnoppen`s 3rd Annual Airport Development & Expansion Summit featured the most prominent industry leaders, international experts, and government officials from across the region providing informative and inspiring discussions pertaining to the region’s current needs and ambitious future. Airport authorities, operators, civil aviation executives, government officials, and construction companies discussed and explored the market and sought to support project development with consultants, architects, equipment providers, and service groups in depth. The delegates shed light on the airport and aviation industry development, capabilities and future perspectives, greenfield and expansion projects, current opportunities and pitfalls, financing, design, operational excellence among many others topics during the two day program. While there were a number of outstanding speakers at the event, the Chairman of the summit, Mr. Chris Chalk particularly stood out not only was he a brilliant Chairman, ensuring that the summit ran smoothly, but also his long experience in this industry made him a well-respected figure and the delegates listened intently to his comments and evaluation. 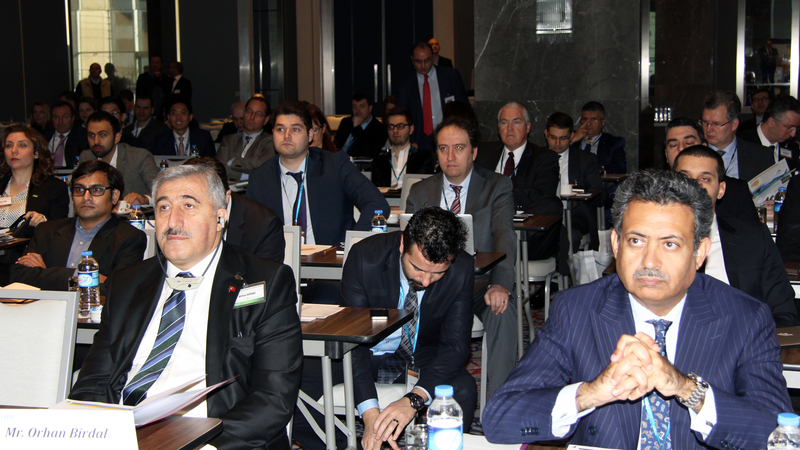 The 2015 conference was opened by keynote speaker Mr. Orhan Birdal, Chairman and Director General of DHMI (General Directorate of State Airports Authority of Turkey). In his speech Mr. Birdal emphasized the importance of Istanbul, as it is located in the epicenter of Europe, Africa, Middle East and Asia. He indicated that the Istanbul New Airport will be the shining star of the global aviation, as Istanbul, and Turkey, continues to be an ever-growing touristic attraction, financial center, and soon to be the most important passenger and cargo traffic hub in the World. Mr. Philippe Merlo, Director of Air Traffic Management at EUROCONTROL was the second speaker of the event sharing insight on challenges of growth and European solutions. He successfully outlined the main principles, issues, and Eurocontrol`s recommendations in order to develop awareness to resolve current bottlenecks. As flight demand exceeds the airport capacity, priorities and solutions are geared to new airport/runway infrastructure, more integrated airport/network operations, and SESAR projects for airport improvements. Mr. Richard Meredith, Chief Development Director of IGA (Istanbul New Airport) was next on the stage providing details of the breathtaking mega project with a keynote presentation: “Building & Commercialising the Airport of The Future”. His presentation covered the key drivers and major components of the project and was chosen as one of the Top 3 presentations of the event by participants. 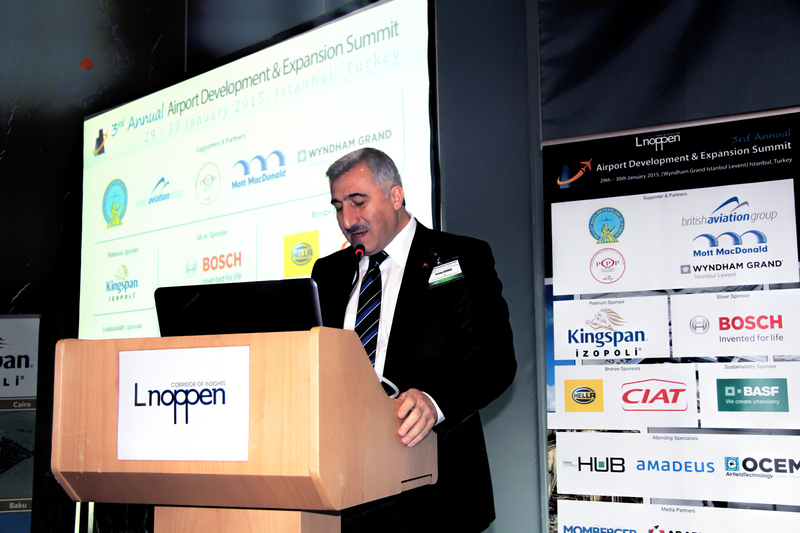 Before the first break Mr. Serkan Kaptan, Deputy CEO at TAV Airports Holding shared the activities and projects of the global operator and airport construction company with a keynote presentation including the details of the latest project: Medinah Airport. By realizing the first full airport concession in the GCC, TAV Airports strengthen its dominance in the region with this project. 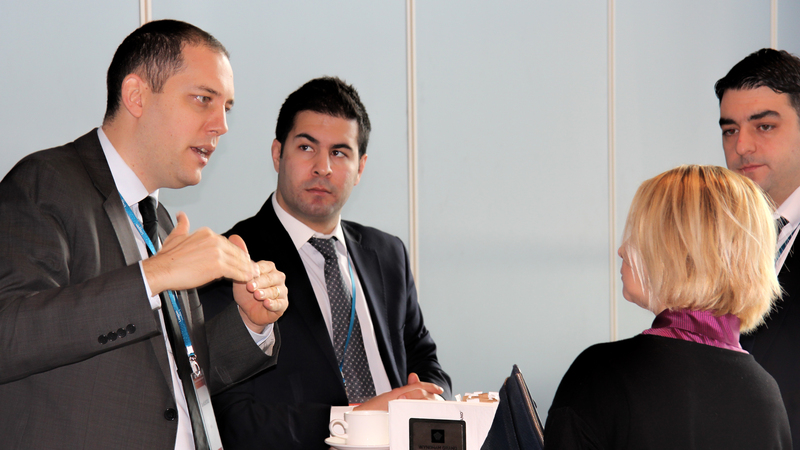 Following the networking tea break Mr. Jim Robinson, Aviation Strategic Advisor at ARUP shared Arup’s global engineering experience. He shared case studies on GCC and Asean regions along with his personal experiences. His mention of the Dubai Airport Sector Strategy and Airport of the Future Criteria led to livelier discussion at the end of the presentation. As the Platinum Sponsor of the Summit, Kingspan – Izopoli speakers, Dr. Suat Kıroğlu, Vice Chairman & Commercial Director of Izopoli Yapı Elemanları and Mr. Paul Kinsey, Business Development Manager – GCC at Kingspan Insulated Panels were on stage presenting their solutions for the industry. 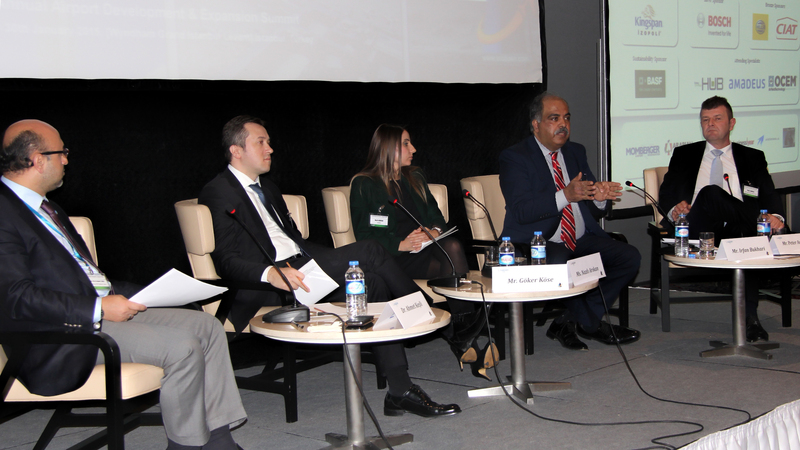 Kingspan`s presentation was followed by Mr. Berk Albayrak, Chief Operating Officer of Istanbul Sabiha Gökçen International Airport. Mr. Albayrak shared the outstanding performance of the airport, including construction and operation periods, reaching maximum capacity in almost 5 years of operation with a yearly growth of 20%. This growth backed up by connectivity advantages of ISG, are the clear motives of upcoming infrastructure investments such as second runway, parallel taxiway and terminal expansions. “View from the Top” was the discussion topic that Mr. Mohamed Yousif Al-Binfalah, Chief Executive Officer of Bahrain Airport Company and Mr. Berk Albayrak, Chief Operating Officer of Istanbul Sabiha Gökçen International Airport evaluated the recent development in the industry under the chairmanship of Mr. Reinhard Zeiler, Managing Director of On Block. Real-time issues confronting the industry as well as the challenges restricting the decisions were discussed in detail. As both C Level executives were representing the airports, successfully growing under the pressure of bigger giants in their region, their strategies and recommendations were carefully noted and the audience was fully focused during the debate, which had a level of transparency that was greatly appreciated. Following the lunch break, Mr. Mohamed Yousif Al-Binfalah, CEO of Bahrain Airport Company was back on the stage, sharing insight on the New Terminal Development. The airport modernization program with the development strategy was laid out: including possible scenario options, detailed future masterplan, new terminal development and procurement strategy. All in all, it was a perfectly structured keynote presentation backed up by 27 years of experience, engineering and business administration background reflecting in the details. As an expert in operational readiness and airport transfer, Ms. Ivonne Kuger, Head of Consulting at Munich International Airport, successfully laid out efficient airport design & start-up including lessons learned from 20 years of international consulting. Her experience combined with Munich Airport`s master plan designed for unconstrained growth and efficiency with clear separation of airport functions clearly demonstrated the German expertise for successful airport development on the stage. From design to operations, the road was guided throughout the various stages of development. Mr. Evgeniy Krasikov, Director for Strategic Communications at Airports of Regions was next on the stage laying out the existing and upcoming projects while carefully analyzing the trends and Moscow`s aviation hub. As the largest regional airport holding in Russia with substantial projects in pipeline, like Saratov and Rostov-on-Don, his presentation demonstrated the existing lucrative development opportunities in the market. Before the networking coffee break, Mr. Reinhard Zeiler, Managing Director of On Block, provided a case study presentation on: How an ORAT program can support a fast track-build airport facility . He spoke on the New Terminal 3 at Sao Paulo International Guarulhos Airport and the presentation was followed by a very detailed video showcasing the stages of the program implementation. After a successful first day the Chairman closed by summarizing the day and outlining tomorrow’s program, delegates enjoyed a welcome cocktail in the foyer. Elegant and relaxing environment provided by Wyndham Grand for additional networking opportunities was a great closing for the busy day. Day two kicked off with the chairman`s short summary of the day one and presentation of two ladies: Ms. Ekaterina Volkova, Deputy Director of Design Department and Ms. Jennet Bayramova, Architect at Progresstech demonstration local traditions in modern format. New Airport Turkmenabat was used to demonstrate the capacities of the engineering and design company where challenging environmental conditions of developing this project were mentioned throughout the day in various occasions. Prominent speakers at the event included Mr. Michael McElvaney, Vice President of Operations at Hamad International Airport. As an expert in facility readiness and operational processes with 32 years of experience in the industry, the case study of Hamad International Airport expansion project to increase capacity and drive future growth were followed by the audience with great interest. The momentum kept growing with the following speaker, Mrs. Pınar İlki Emekçi, Director & Partner of GMW Mimarlık who presented the details of Terminal 5 of King Khaled International Airport in Riyadh. As GMW continues to establish its name in the market, following the successful execution of Madina Internatonal Airport design, which recently acquired LEED Gold certification, she elegantly presented the project and described how they managed to develop their design approach, reconciling the needs and expectations of the various stakeholders including the operators, the airlines and passengers. The impact of the well-presented case study was still echoing during the tea break among the participants. One of the most popular speakers at the event was Mr. Gudmund Stokke, Principal Partner of Nordic Office of Architecture. As the designers of the Mega Airport Project in Istanbul and Oslo Airport Expansion Project, his vision and wisdom in planning spaces took the delegates on a 30 minute journey: he described DESIGNING THE AIRPORT OF THE FUTURE while incorporating both creativity and functionality in design and his presentation became a joyful experience and indispensable lecture. His presentation was the most sought after file, during and after the event, by the participants. As an industry giant, Aecom was also among the distinguished speakers of the summit where Mr. Bernardo Gogna, Senior Vice President of Director Global Aviation at Aecom shared the experience and lessons learned from the mega airport projects. Every stage of developing the project were carefully underlined, the key mistakes of the stakeholders were outlined and expert recommendations were provided to the audience. His presentation was followed by Mr. Gürani Kılıç, Regional Director of Bosch Security Systems, demonstrating Bosch’s integrated security solutions at airports: Bosch system benefits include improving passenger experience, increasing non-transport revenues, and assisting airport operations were exampled. The designers of the event were next on the stage under the chairmanship of Mr. Johann Frank, Managing Director of Airport Consulting Vienna. His panelists were Mr. Gudmund Stokke, Principal Partner at Nordic Office of Architecture, Ms. Ekaterina Volkova, Deputy Director of Design Department at Progresstech and Mr. Mark Longrée, Managing Director & Architect at IMPaC International brainstorming on designing the demand & return on investment while keeping the customer in mind for the next 45 minutes. They have discussed in detail the strategies for reaching and monetizing a new generation of customers: Who are they and what do they want? How can you design for the common goal to improve passenger satisfaction and brand recognition while optimizing profitability. After the lunch break one of the most popular speakers at the event Mr. Piet Demunter, Head of Airport Development at the Brussels Airport Company introduced Brussels` Airport Dynamic Airport Development program ensuring sustainable value creation. The presentation was selected as one of the most impressive presentations by the participants at the end of the day. The final speaker before the last discussion panel of the event was Mr. Pieter van der Horst, Airportcity Developer at Amsterdam Airport Schiphol. His finance and real estate background combined with Schiphol Airport`s track records in developing non-aviation revenues were solid indicators of credibility. His presentation advising on “Enhancing non-aviation revenues by masterplanning & commercial development of the airportcity” revealed many ways to guide fellow colleagues to re-evaluate their master plans. Last discussion panel Operational Excellence was chaired by Mr. Bernardo Gogna, Senior Vice President of Director Global Aviation at AECOM in conversation with: Mr. Michael McElvaney, Vice President of Operations at Hamad International Airport, Mr. Piet Demunter, Head of Airport Development at Brussels Airport Company and Mr. Pieter van der Horst, Airportcity Developer at Amsterdam Airport Schiphol. Panelists discussed in detail how to provide better & faster passenger flow by continual improvements on the procedures and operations as well as ways to improve passenger experience. The event was finalized with the chairman`s closing remarks. Lnoppen thanks all our supporters, eminent speakers, participants and sponsors: DHMI, Brisitsh Aviation Group, International PPP Platform Turkey, Mott Mac Donald, Wyndham Grand Istanbul Levent, Kingspan – Izopoli, Bosch, Ciat, Hella, BASF, Hub Parking, Amadeus and OCEM for their contributions to the event.